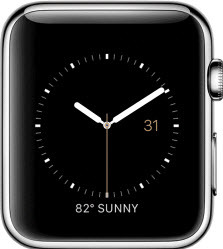 From the watch face screen, swipe up to access the Control Center. Some watch faces display signal strength when connected to cellular. Verify that you have an active cellular connection (i.e., the signal icon is highlighted in green). 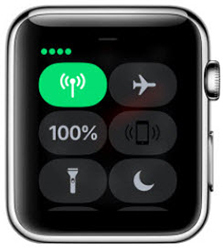 The image below shows signal strength indicated by the dots in the upper-left and only appears if your watch is connected to a cellular network.